Shovel 750L Scoop Tipping Bucket for Forklift | SalesBridges B.V.
Shovel, Scoop bucket, Tipping Bucket SBTCSH750L. Suitable for forklift. The shovel is an ideal scoop bucket for various loose materials. 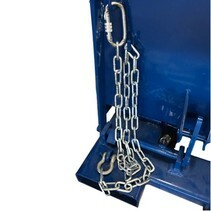 With a safe and stable unlocking mechanism which can be operated by a pull cord from the driver's seat of a forklift. For extra safety, the shovel can be secured with a safety chain on the forklift. Add the Safety chain and cable set to your order. This is an ideal mechanical tipping bucket for scoop up for example potatoes, grain, fertilizer, potting soil, sand, gravel, compost, etc. The SBTCSH series shovel bucket is designed from special steel with forward inclination for the most efficient and thorough collect of materials. Made of high-quality steel and finished with powder coating.. The design is simple, robust and very durable. The welded steel construction and reinforced peripheral edge ensure long lifetime. Professionally finished with powdercoating RAL5010. Shovel Application: potatoes, grain, fertilizer, potting soil, sand, gravel, compost, etc.